STEMteachersNYC is always delighted when we hear success stories from our members and workshop participants; especially when they get inspired from attending one of our workshops. 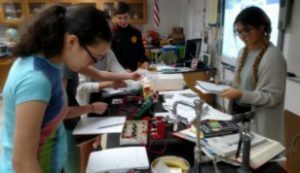 Check out how physics teacher Alan Zollner from Hendrick Hudson High School took what he learned from Mark Schober in his Photoelectric Effect Workshop and talentedly incorporated it into his own storyline for his high school physics class. Introduce the wave–particle duality of light through the Photoelectric Effect. Appreciate the progression from scientific inquiry to engineering application for the benefit to society. To start he introduced the notion of light’s wave-particle duality with a curiosity generating demonstration, Young’s double-slit experiment, which shows an interference pattern proving light also behaves as a wave. 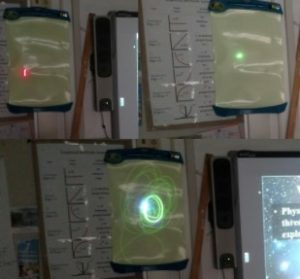 For some extra interest and engagement he had his students explore a laser glow station with the a guiding question – Why does the violet colored laser cause glowing, but not red or green? 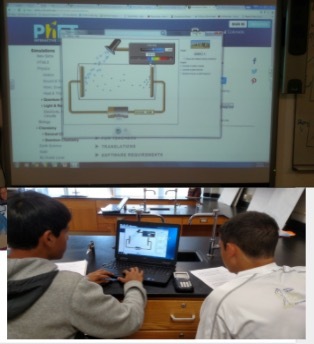 Then to build-in some more guided exploration and sense-making he incorporated a related PhET Photoelectric Simulation to investigate the effects of frequency, intensity, stopping voltage, and photoelectric current. Followed by a notable reading – a segment of Einstein’s Nobel Prize winning paper. 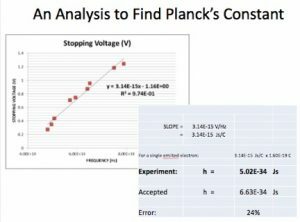 From there he introduced the photoelectric apparatus from Mark’s workshop to collect some real data! Students whiteboarded, discussed and analyzed the data to find Planck’s Constant (the relationship between the energy a photon carries with the frequency of its electromagnetic wave). To connect and apply this new understanding of the relationship between light and energy to engineering applications in today’s world, they learned about solar panels (energy, power, and environmental benefits).